-50% of total amount upon confirmation. -50% 3 weeks before embarkation. -If the request is less than a month from the embarkation date, the full amount is required with the confirmation. 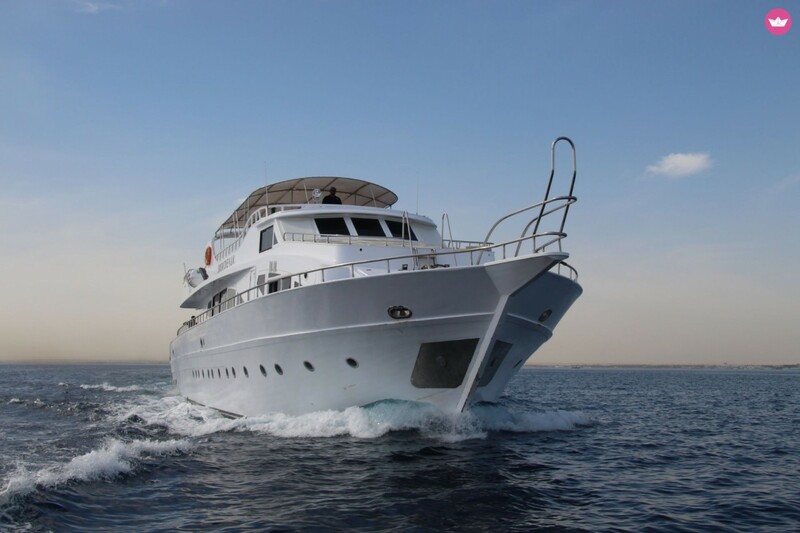 Elegant Comfortable Boat, sail North and South the Red Sea, for a week or mini kitesurf and snorkeling cruises. Day 1: Arrive at Hurghada Airport and transfer to the Motor Boat “SimSim Dive”. Meet by the captain and crew, cabins check-in, evening free at leisure, dinner, and overnight aboard. Day 2 to Day 6: Early morning we’ll start the sail to enjoy the unforgettable kitesurf experience, we’ll sail around 3 to 4 spots, depend on the wind; Ashrafi, Geisum, Tawila and Abu Mongar islands. Day 3: Continue our kitesurf cruise, tonight will enjoy a BBQ dinner on an island while having a lot of fun around. Overnight aboard. Day 7: Breakfast while sailing back to the marina, arrive during the sunset. Tonight will enjoy the last dinner aboard with candlelight and a special meal to farewell the boat and crew. Overnight aboard. Day 8: After breakfast, transfer to Hurghada Airport and fly back home. - Price is quoted for a minimum of 10 paying passengers to start the sail. - Prices are valid till 30/04/2019. - Flexible embarkation days, with 7 nights/8 days aboard Motor Yacht “SimSim Dive” on full board, 3 rich meals per day, water, soft/hot drinks and snacks throughout the stay. - BBQ dinner on an island during the cruise. - Candlelight dinner the last night aboard the boat. - Group transfer to/from the boat. - The kitesurf equipment, to be booked and paid with the invoice. - The travel arrangements: Egypt entry visa (required) Airport arrival meet and greet, and departure assistance: 60€/person. - Alcoholic beverages, available aboard and pay directly to the crew. - 4 nights/5 days aboard the boat on full board, 3 rich meals per day, water, soft/hot drinks and snacks throughout the stay. - Snorkeling equipment and master. Please contact us if you need any assistance or have a special request. I'll happily help.